For more than 125 years, Brooklyn Kindergarten Society has provided children from low-income families a quality education that cultivates the skills they need to succeed in kindergarten and beyond. BKS teachers use research-based curricula, receive ongoing professional training, and understand how children learn. Classrooms are inviting and designed for creative learning. Enrichment activities are a unique feature of BKS and are key to developing a child’s cognitive, interpersonal, and strategic skills. We recognize that families—the key to children’s success—often benefit from resources and support beyond the classroom. To that end, BKS’s Family Services staff provides counseling, referral services, and workshops for children and their families. In the first few years of life, children absorb knowledge at a remarkable rate. By age five, most children have built more than 90% of their brain connections—connections that will stay with them for the rest of their lives. By age three, a child from a low-income family has heard 30 million fewer words than his or her higher-income peers. Early education affects an individual’s economic advancement and affects society’s poverty, health, remedial education, and criminal justice system expenditures. Although BKS receives government funding, that funding falls short of meeting the needs for high-quality early childhood education. Private support from our generous donors provides BKS children and families with excellent teachers, research-based curricula, family service programs, and unique enrichment activities—a quality of care and education that children from low-income families rarely receive. 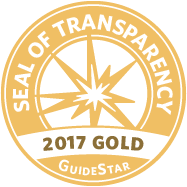 Brooklyn Kindergarten Society received the GuideStar Gold seal for organizational transparency. You, your spouse, or your partner may work for a company whose matching gift program may double or even triple your donation. Ask your human resources department or contact BKS to see if your employer matches. Please contact Tania Kleckner Senior Development Associate. AmazonSmile: Make Brooklyn Kindergarten Society your preferred charity. When you shop with AmazonSmile, Amazon will make a donation to Brooklyn Kindergarten Society.